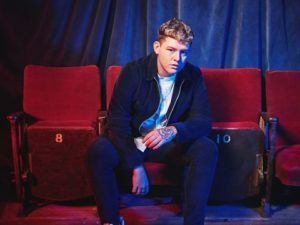 Michael Rice will represent the UK in Tel Aviv after winning Eurovision: You Decide with his version of entry Bigger Than Us. Eurovision: You Decide saw six hopeful artists delivering their version of one of three competing songs. In the end, it was Michael Rice with his version of Bigger Than Us who got the ticket for Tel Aviv. Could the revamped format of its selection give a better result for the UK this year? For the first time, Eurovision: You Decide was broadcast from MediaCityUK in Salford, Greater Manchester. Like last year, the hosts were English TV presenter Mel Giedroyc and Eurovision 2015 winner Måns Zelmerlöw. Unfortunately, the organization was marred early on due to over-provision of tickets. Ticket holding fans, some of them having traveled from distant parts of the UK in order to attend, had to be turned away because the seating capacity of the studio was smaller than the number of tickets allocated. As in the previous three editions of the show, the shortlisted entries were sourced by a combination of open as well as invited submissions of entries. Once more, fan club OGAE UK, the British Academy of Songwriters, Composers and Authors (BASCA) and the British Phonographic Industry (BPI) were invited by the BBC to each assist with different parts of the shortlisting process. For the first time, it was international juries, as opposed to a panel of music industry experts, that were asked to select the three finalist songs for tonight’s show. The major format change for 2019 however was that each of the songs got performed in two different musical versions by two different acts during a duel round. Once each pair of acts performed, a panel of judges decided which version would go through to a final public vote.The panel was comprised of presenter and DJ Marvin Humes, girl group The Saturdays’ Mollie King and chief judge, presenter and singer Rylan Clark-Neal. Coming from a musical family, Kerrie-Anne is also a trained teacher. She cites Abba as her all time favourite Eurovision act but, during the intro video to her performance, was very keen to point out how taken she was by Eleni Foureira and her sensational performance for Cyprus in Lisbon last year. The singer was joined by four dancers on stage, two male and two female, dressed in black sequined numbers to her silver and gold fringed mini dress. This was a well-worked and confident performance that got the audience going. Head judge Rylan Clark-Neal sounded pleased: ‘Kerrie-Anne, this is the kind of song I want to see for a long time’, later liking the artist to Eleni Foureira, Kerrie-Anne’s self-confessed inspiration for taking part in the British selection this year. Anisa was named by the BBC Asian Network as one of its Future Sounds in 2016. The artist has had some stellar collaborations so far, including having co-written Ariana Grande’s Piano and a recent track for former Eurovision entrant and platinum selling artist Frans (Sweden 2016). Tonight was apparently the first time that she had to perform a song she has not written herself. This is a balled version of Sweet Lies, a bit reminiscent of the 2017 UK entry Never Give Up On You, which sets off nicely Anisa’s beautiful, velvety voice. The artist appeared on stage playing the piano dressed in a low-cut black dress with two female backing vocalists accompanying her atmospheric performance. She later started to move around the stage with the crowd occasionally breaking into applause in response to her vocal delivery. ‘Your vocals were flawless’ were Marvin Humes’ comments, liking her to Ariana Grande. However, in the end, all three judges voted for Kerrie-Anne to go through to the final vote. This version of the song is characterized by richer backing vocals for the chorus and a playful counter-melody that add memorability – the short of tune that you are likely to whistle even after the performance has finished. ‘Absolutely loved it!’ was Mollie King’s reaction, while Rylan likened the contestant to Mikolas Josef (Czech Republic 2018), Jordan’s favourite Eurovision entrant, adding that he expected he would win people over with his personality during a promo tour. According to the official BBC Eurovision website, MAID are Blythe, Miracle and Kat. They come from from Edinburgh, Devon and Bristol respectively. Kat is half-Norwegian and says that she can remember Eurovision parties while holidaying in the Fjords. The girls formed a band in 2018 after meeting at drama school. They have often found themselves as understudies in West End musicals, and their name refers to the fact that they often feel like a secret society just like the maids they come to play, as they think that maids are often in a secret society gossiping about the families they serve. They describe Freaks as being ‘about celebrating everyone’s individual personality, about the people who maybe don’t fit in and it’s about bringing everyone together.‘ Their mid-tempo take has a lot of quirky electronic percussion accompanying their beautiful harmonies. The trio appeared standing behind microphone stands and wearing jumpsuits in different cuts and colours. They followed a well-worked routine, which was appropriately quirky. The harmonies were not always as strong as they sounded in the recorded version of the song. Rylan did not sound enthused: ‘I have to be honest, girls. Everyone backstage has being saying what lovely girls… I don’t love it, I’m afraid’, with Marvin agreeing. Mollie, however, expressed support to a fellow girl group. Despite being just seventeen, Holly has already participated in the 2017 edition of The X Factor, where she reached the semi-final of the competition while being mentored by Sharon Osborne. She singles out Lucie Jones (UK 2017) as one of her favourite Eurovision entrants. Holly appeared sitting on a chair in the middle of the stage wearing an impressive red fringed jumpsuit. There was a geometric impression of mountains in the background. She soon stood up and two male dancers dressed in black and wearing cowboy hats joined her on stage carrying out, true to the style of this version, a line dancing inspired routine. The performance went down really well, with the audience clapping along and giving it a strong applause in the end. ‘This was a great song and you did it justice’ was Marvin’s comment, whereas Mollie was impressed with Holly’s live vocals and Rylan considered the jury vote element at Eurovision: ‘this song would do very well with the jury’. Michael Rice is the winner of BBC One talent show All Together Now and an enthusiastic advocate for anti-bullying. He counts Salvador Sobral (Portugal 2017) and the co-presenter of tonight’s show Måns Zelmerlöw (Sweden 2015) as his favourite Eurovision winners. Michael describes his version of Bigger Than Us as ‘an epic, big song with a big key change and harmonies, and I think the lyrics resonate with everyone.’ Indeed, whereas this version starts as a simple arrangement showcasing Michael’s emotional delivery, the musical production and backing vocal build up in volume for the chorus – suitably in time for the ‘bigger than us’ line – adding the ‘epic’ element that the artist himself mentions. Michael started his performance in the middle of the stage. On either side of the stage, there were a pair of a male and a female vocalist. There was a beautiful backdrop of an impression of stardust lines that changed into one of spotlights in time for the chorus of the song. Michael got more confident as the performance progressed winning over the crowd who sang and moved along. This was probably the toughest decision to be made by the judges. In the end, all three judges voted for Michael, adding how brilliant Holly was, too. The three finalists got to sing their songs again. This time it was the viewers, through both telephone and online voting, who got to cast their vote. Current Eurovision winner Netta was the surprise guest act. During a special video, Netta gave a portrait of Tel Aviv as well as noting that the contest goes to Israel every twenty years and introducing some of the 2019 entries that have already been selected. After all three finalists had finished their performances, Netta, in a very characteristic hairdo and silvery frock, performed her winning Toy, standing behind her characteristic mixing deck to start with and then moving onstage surrounded by two female dancers to enthusiastic applause from the crowd. During the public voting, there was also a video featuring Graham Norton, the BBC’s commentator for Eurovision. Norton commented on the way the contest is perceived in other European countries as well as on previous entries, including Conchita’s 2014 win for Austria. This was succeeded by last year’s UK entrant, SuRie, giving an atmospheric performance of Storm at her piano and accompanied by a string quartet. There was a lot of banter between presenters Mel and Måns about the recent, less than successful UK attempts at Eurovision before Måns broke into a medley of British entries: Sandie Shaw’s Puppet On A String (1967 winner), Cliff Richard’s Congratulations (1968, second place), Brotherhood Of Man’s Save Your Kisses For Me (1976 winner), Bucks Fizz’ Making Your Mind Up (1981 winner) – for this one, Måns was joined by three of the original group members and had to lose his trousers in tribute to the iconic skirt-ripping choreography of the song -, Sonia’s Better The Devil You Know (1993, second place), Gina G’s UK chart topper Ooh Ah Just A Little Bit (1996, eighth place), and, joined by Katrina of Katrina and The Waves, Love Shine A Light (1997 winner). In the end, all three finalists were brought onstage. Michael was announced as the winner and, noticeably shaken, went on to sing Bigger Than Us, the UK’s 2019 Eurovision entry. The UK has been one of the most successful competing countries in Eurovision. As highlighted by Måns Zelmerlöw’s medley performance tonight, the UK has had wins in 1967, 1976, 1981 and 1997. There was one more British win at Eurovision – that was Lulu and her commercial hit Boom Bang-a-Bang in a 1969 four-way tie with France, Spain and the Netherlands. The country also holds some substantial Eurovision records: that of finishing as a runner-up on a staggering 15 occasions, as well as finishing in the top ten every year it participated in the 20th century save for three occasions (in 1978, 1987 and 1999). The track record is not as impressive for the 21st century however. This may have been partly due to the fact that the UK no longer had the advantage of being one of only 2-3 countries that sang in English, i.e. a language widely understood across Europe. Since last lifting the rule that obliged countries to perform in their own official language(s) in 1999, the UK has only ended within the top ten in two occasions: in 2002 with Jessica Garlick and Come Back (joined third place) and in 2009 with Jade Ewen performing It’s My Time (fifth place), an entry notably co-created by celebrated English composer Andrew Lloyd Weber. As a member of the Big 5 countries (along with Germany, France, Spain and Italy), the UK qualifies automatically for the Eurovision Grand Final. Last year, SuRie and Storm finished at 24th place with 48 points. Her live performance was controversially interrupted by an intruder who managed to get onstage protesting against the British media. SuRie managed to finish her song after the intruder had been removed from stage and, though she was given the opportunity, declined to perform the song again saying that she was proud of her performance. So what do you think of Michael Rice and Bigger Than Us in the video below? Could 2019 be the year when the UK revives its Eurovision fortunes?